Apple has updated the iOS incarnation of GarageBand to add Audiobus support. 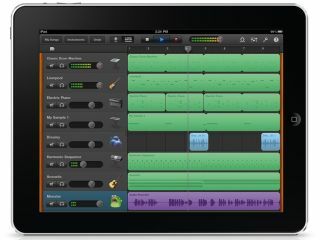 The addition means that users can now bring audio from other supported iOS applications into GarageBand for recording and playback via the separate Audiobus app. It's a feature which adds considerably to the usability of the already-fantastic mobile DAW. By way of celebration, Audiobus is currently available from the App Store for half of its usual price (now £2.99/$4.99.) For a full list of iOS applications that currently support Audiobus, check out the developer's official site. Relatedly, yesterday saw the unveiling of iOS audio routing tool JACK Audio Connection Kit - seemingly a direct rival to Audiobus. This endorsement from Apple, however, is sure to give Audiobus the edge for the time being. Version 1.4 of GarageBand for iOS also adds the option to disable snap-to-grid while editing.